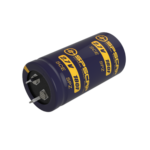 As shown in the curve, charge ultracapacitor to rated voltage with constant current and continuously apply rated voltage for 30 minutes, then fully discharge the capacitor with constant current I. 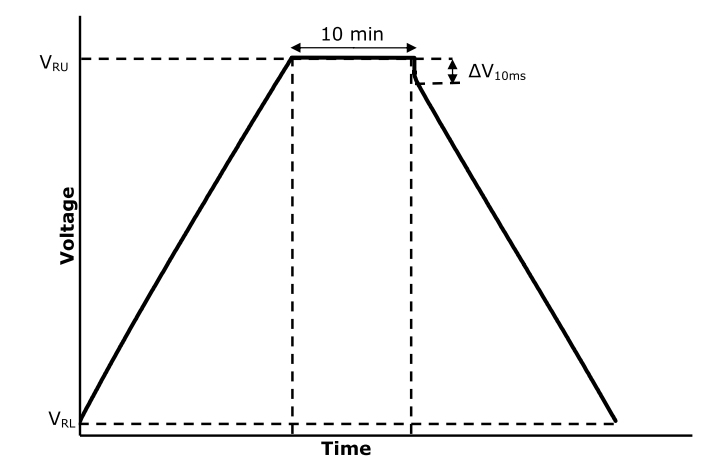 Draw an auxiliary line while extending the straight part of the time-varying voltages between the capacitor terminals obtained from the voltage recorder, read the voltage drop ∆U3 obtained from the intersection of the auxiliary line and the time base at the time of discharge start shown in Figure, and then calculate the internal resistance by the following formula. As shown in the curve, charge ultracapacitor to rated voltage through constant current and continuously apply rated voltage for 10 minutes, then fully discharge the capacitor with constant current I. ΔU10ms is the difference between voltage measured just prior to discharge and the voltage measured at the device terminals at 10mS after a discharge, and then calculate the internal resistance by the following formula. 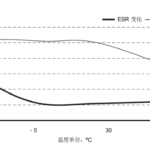 As shown in the curve, the procedures are: 1 rest for 10s; 2 charge the capacitor to rated voltage with constant current; 3 rest for 5s; 4 rest for 10s; 5 discharge the capacitor to half rated voltage with constant current I; 6 rest for 5s. 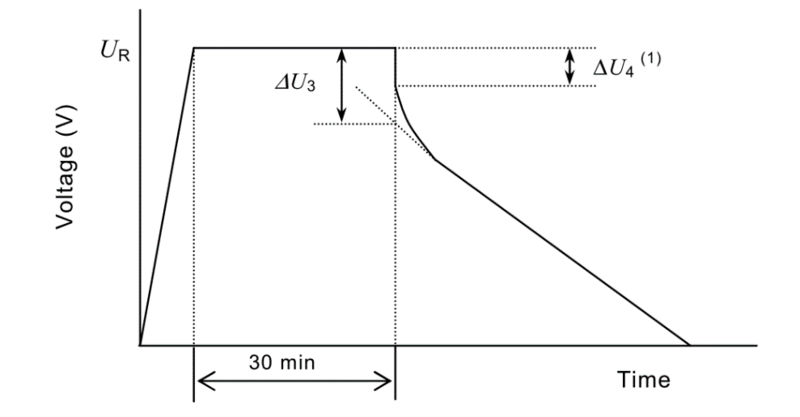 ΔU is the difference between voltage measured at the beginning and ending during step 6, and then calculate the internal resistance by the following formula. 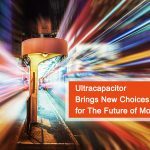 In summary, all three results of these are DC ESR, which is considered in application for ultracapacitor. 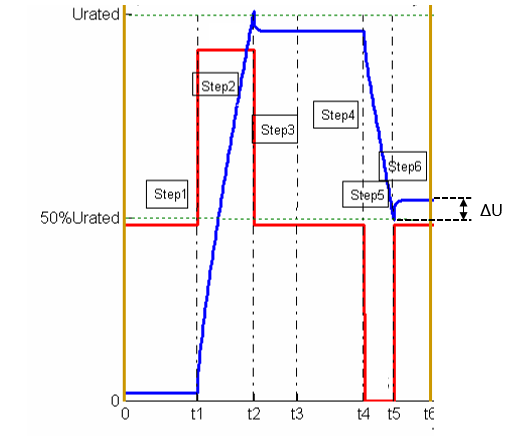 IEC procedure takes long time and not convenient to calculate, worse more, large deviation exists while the auxiliary line range varies, so it is rarely used in the actual test. 10mS procedure also takes long time, and it requires expensive equipment to record 10ms data, hence is rarely used either. 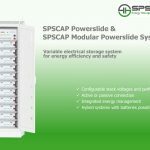 Most manufacturers use 6 steps procedure to test DC ESR, SPS also adopt this procedure. 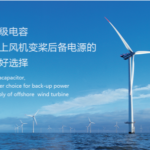 Furthermore, as DC ESR method is complicated and requires special equipment, most customer only use AC ESR method to select products.We will further explore this topic in the next issue.